We at WNST.net, in partnership withRuth’s Chris Steak House and There Goes My Hero, are proud to announce a special event next Tuesday evening, November 24th, with Super Bowl MVP Joe Flacco atRuth’s Chris Steak House in Pikesville. There are several ways for you to be involved in this evening with us. If you’d like to come hang out and be a part of our radio show from 8PM-9PM, you are more than welcome to take part in the Crystal Room at Ruth’s Chris Steak House. Ruth’s Chris is offering their Happy Hour Menu, both for food and drink, to anyone who attends the show. This gives everybody the opportunity to come and experience all that Ruth’s Chris has to offer. You can check out their Happy Hour menu HERE. We’re also hosting an exclusive VIP Meet & Greet with Joe from 7PM to 7:45PM in Ruth’s Chris famed patio room. To be a part of this VIP experience, we’re asking for a $100 donation to benefit #JennStrong2 and There Goes My Hero Foundation. This donation gets you both a special 11×14 Joe Flacco Super Bowl 47 picture that he will autograph for you, a photo opportunity with Joe in the VIP room, access to delicious horderves, as well as one free drink (beer, wine, or mixed drink) courtesy of Ruth’s Chris Steak House. If your business would like to purchase a table of 10 in the VIP patio room, we’re asking for a $1000 donation to benefit #JennStrong2 and There Goes My Hero. For anyone that would like to reserve their autograph and photo opportunity tickets for either the main Crystal Room or the VIP Meet & Greet, or for anyone with any general questions, please email peter@wnst.net and we will place you on our will-call list and you will receive your tickets at the door next Tuesday night. We’re so thankful to Steve DeCastro, Heather Renz, and all of our friends at Ruth’s Chris Steak House for their continued partnership and support of all of our missions at WNST. Thanks to Steve Michaels and all of our friends at our title sponsor, Adams Jeep of Aberdeen, for their support of this great cause, as well as Carl Delmont and everyone at Freedmont Mortgage for presenting all of our live events at WNST. Also thanks to Planet Fitness, Enoch Office, and the Maryland Lottery for being a part of this special night. There Goes My Hero will also be swabbing throughout the night, adding people to the bone marrow transplant database. Are you a candidate to be swabbed? Find outHERE. We hope to see you all out at Ruth’s Chris in Pikesville on Tuesday, November 24th. 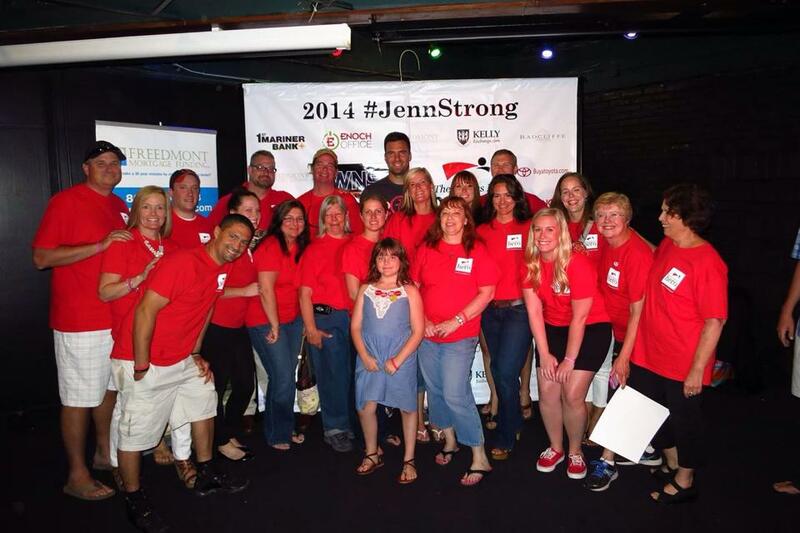 Thanks for your continued support of WNST, as well as our #JennStrong2 efforts. All of your well wishes, thoughts, and prayers are greatly appreciated. Come on out and help make and difference and show our quarterback some support next Tuesday!